SAN DIEGO — The Chargers wrapped up another round of firsts under the new regime of head coach Mike McCoy and general manager Tom Telesco with the completion of voluntary mini camp Thursday.It was a mini camp that McCoy succinctly described as “a good start.”McCoy’s terse and direct style was something that newly acquired cornerback Derek Cox noticed about his coach.“Coach McCoy seems to have total command,” said Cox, who was brought into the organization through free agency. “(McCoy) seems to be very assertive, sure of himself and he’s right to the point, treating us like men, being professional about it,” Cox added. During the past couple of weeks, McCoy was working to introduce the new system to his players — both returning veterans and the new players that Telesco has brought on before this year’s NFL draft. Since the start of mini camp earlier this week, McCoy said that as the players started to become more comfortable with everything, the tempo of practice picked up each day. Danny Woodhead, another of Telesco’s signings this offseason, said that coming into a new system is something that needs focusing on every day. As the team broke from camp, talk of the draft surfaced, to which McCoy said they had a great plan in place. “It’s the first time as an organization, with the new people in here, we’ve all sat down and outlined our plan, what type of players we’re looking for,” McCoy said. Their philosophy for the team’s future, McCoy said, is building through the draft and developing those players. 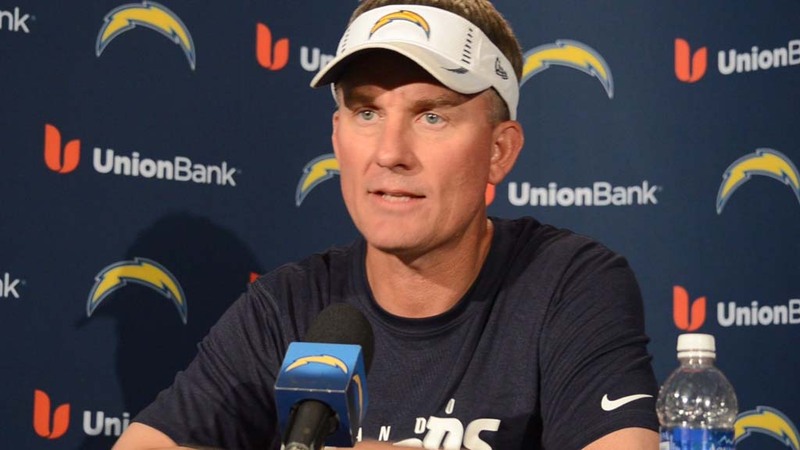 For all of the talk of bringing in new players and developing talent through the draft, McCoy still had plenty of praise for veteran quarterback Philip Rivers. “He’s dying to be the very best, and you love it,” said McCoy. Still early in the process, McCoy said that this mini camp served mostly as an evaluation to the mental side of the game for the players, especially as they adjust to the new system and start using the new terminology. Coming into the Chargers organization from the Jacksonville Jaguars, Cox said the message he’s heard from his coaches, including defensive coordinator John Pagano is that they want to be the best defense in the NFL. With mini camp over, Woodhead said he was hopeful that every single time the team is together, they’re going to be a little more crisp, “because that means we’re getting better as a team,” he said, adding that that is where their focus is — getting better as a team every day, and making this a team, and a team that can compete. The NFL released the full schedule for the upcoming season Thursday night, which will have the Chargers opening their season on Monday Night Football Sept. 8 at home against the Houston Texans.